A large, bus-sized asteroid is set to pass by Earth on Wednesday, days after scientists discovered the rogue space rock hurtling on a course halfway between our planet and the Moon. The asteroid, nicknamed ‘Rerun’ is between 13 to 46 feet (4 to 14 meters) wide and is moving at 16,600 mph (26,000 kilometers per hour). The asteroid, known as Asteroid 2017 BX, will be 162,000 miles away, about two-thirds of the way to the Moon. The Slooh observatory will stream live views of the asteroid as it approaches, starting from 5:30 pm ET. It is expected to pass Earth at 11:54 pm ET. The asteroid, or near-Earth object (NEO), fortunately poses no harm to the Earth and would break apart and burn up thousands of feet in the air if it entered our atmosphere, according to scientists. “During the broadcast, Slooh astronomers will be on hand to answer questions about the newly discovered asteroid," Slooh said. "They'll discuss its size, speed and makeup, while also exploring why smaller asteroids like Rerun and its larger cousin so often go undetected until just days before they reach their closest point to the planet." 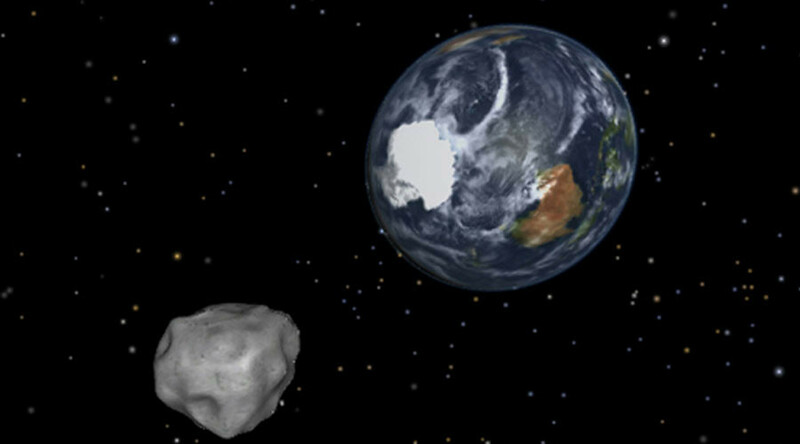 Last week, another miniature asteroid passed between Earth and the Moon. Both asteroids are said to be moving too slow, and are too small to present a real threat to our planet.